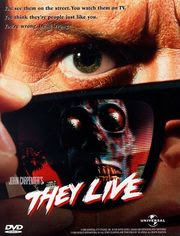 They Live (1988)- Part science fiction horror and part dark comedy. The ruling class within the moneyed elite are in fact aliens who have hypnotized the populace through subliminal messages transmitted via mass media. Nada (Rowdy Roddy Piper) joins the underground to eradicate the lizard-like aliens, which are revealed when he looks through special Ray-Bans developed by the resistance. Directions: on River St. cross Hwy 1 and turn left at Encinal (at light). Go down the way a bit. Turn left at Debois St. and screening will be in a field on the right. PLUS short films, an brief intermission, and great company. SANTA CRUZ GUERILLA DRIVE-IN is an outdoor movie theatre under the stars that springs up in the fields and industrial wastelands. Beyond showing great movies and bringing a broad community together, part of our mission is to help reclaim public space and transform our urban environment.